With adoption rates on the rise, drones and are making a splash in the Oil and Gas sector, providing improved communications, safer work enviornments and more accurate data alll while saving companies both time and money. Below we discuss the primary ways, drones can streamline operations in the indsutry. Drones are a versatile platform that can be outfitted with a wide range of cameras and sensors that can collect vital data in real time. Businesses can easily integrate digitized mapping information and other data from drone flights into analytical and AI solutions for advanced processing. For example, software solutions use topographical and geological data gathered by drones to create models that help identify promising oil and gas drill sites. Not only do drones gather information more efficiently than human inspectors, the digital data enables employees to make better, data-driven decisions. This drastically reduces downtime, catches conflicts and issues faster, and helps keep your operation running smoothly. Inspecting O&G infrastructure and gathering critical data with drones cost substantially less than traditional inspection methods that require ground crews or manned flights. Drones are tough birds and can withstand harsh temperatures and other conditions. They get much closer to infrastructure than a helicopter or airplane, providing better visuals and data. Drones also minimize downtime by avoiding the need to shut down operations for inspections and by catching leaks and other maintenance issues early, lowering remediation costs. Drones enable employees to conduct inspection and monitoring tasks without exposing themselves to the typical dangers of O&G operations. As a result, work hours lost due to injuries decline, medical expenses and insurance costs shrink, and the number of workplace events reported to OSHA and other regulatory agencies drop. Manual infrastructure inspections are often dangerous. For example, inspectors at wells and offshore rigs must climb up and down ladders and along catwalks — and even use cranes or harnesses and rappelling equipment to reach equipment. Inspectors sometimes must work in close proximity to harmful chemicals and dangerous machinery. Drones perform inspections without risking employee safety. They’re particularly useful for inspections after blowouts or natural disasters — or when sending a ground crew to a site may be difficult, costly or unsafe. The remote nature of oil and gas work often requires operators to communicate with workers on sites around the world. This can present a challenge to managers and engineers working from the headquarters and collaborating with the boots on the ground. But drones can make things easier. Workers on the ground can fly drones on their site and upload the data to the cloud where back office managers can review and coordinate further inspection or follow ups — all without leaving the desk chair. Using software such as DroneDeploy makes it easy for the back office to markup maps or drop in annotations in real time so that inspectors can check on pressure points, leaks, or other potential issues. Check out www.appliedaeronautics.com to learn more about drone technology. A 2018 study by Skyward technologies, showcases a dazzling future for the commercial drone industry. It’s one rife with global growth and opportunity across multiple industries. According to the studies findings, one in 10 companies with revenues of $50 million or more use drones today. Even more impressive is that 92% of those companies experienced a positive ROI on their drone investment in just one year — and in some cases less. Adoption rates vary from industry to industry, with construction and engineering leading the pack, followed by government applications. About half of surveyed respondents reported that their company’s bottom line would suffer if their company did not use drones. A majority of respondents realized a positive ROI on their investment in one year or less. Drone adoption is highest in the construction and engineering industry, followed by government. Four in five companies expect their drone flights to increase year over year. The impact UAV’s will have on both commercial and government operations in the coming years is sure to be significant. A recent study conducted by AUVSI concluded that the drone industry alone will create more than 100,000 new jobs by 2025, and have an economic impact of $82 billion. Universities across America are preparing their students for rewarding careers in this new industry by offering degree programs in both piloting and engineering. Below is list of the colleges leading the drone training charge. Spartan’s Aviation Electronics Technology program (AET), is one of the first to specialize in UAVs, taking an electronics approach to Unmanned Aerial Systems (UAS). Graduates of the AET program are qualified to work in a variety of positions and industries ranging from Aerospace, Communications, Simulator Development, Robotics, UAV and beyond. The program is certified by the National Center for Aerospace and Transportation Technologies (NCATT). Graduates are also prepared for Federal Communications Commissions (FCC) and Certified Electronics Technician (CET) certificates and licenses. Embry-Riddle’s Bachelor of Science in Unmanned Aircraft Systems Science degree equips students with the necessary knowledge and skills to seek employment in a wide variety of Unmanned Aircraft Systems (UAS) related fields, including UAS pilots, sensor operators and ground technicians. Students enrolled in the program explore coursework in aeronautical science, unmanned aircraft systems, computer science, robotics, and engineering, providing graduates a wide breadth of knowledge to become industry leaders. The program also highlights issues such as the integration of unmanned aircraft into existing infrastructure and requires students to make reasonable predictions of how the current system will accommodate the addition of cutting-edge technologies.Additionally, Embry-Riddle has paired with local organizations to establish land use for academic flight operations. Students, under faculty guidance, have the opportunity to operate a host of unmanned platforms in actual environments, which further broadens capabilities and exposure to industry standards. The UAS option at Oklahoma State, available for both the degrees of MS and PhD in Mechanical and Aerospace Engineering, provides students with a recognized emphasis in graduate level work in the area of Unmanned Aircraft Systems. It provides students with hands-on analysis, design, construction and flight testing of UAS platforms. Flight testing and operations to be conducted at OSU UAS airfields in Stillwater and at Ft. Sill, Okla. The University offers a bachelor of science (B.S.) in unmanned systems.This degree program prepares students for entry and advancement within the aerial, land, and water vehicles/robotics workforce of the future. The program is one of the first of its kind in Indiana and one of only a few in the United States.Coursework includes a 21-credit unmanned systems core, a 28-credit aviation core, and the University's Foundational Studies Program, which provides the knowledge students need in critical thinking, leadership, and interpersonal and communication skills. Students are encouraged to purse a minor field of study, especially in areas where unmanned systems will play an important role. Suggested minors include: aviation technology, criminology and criminal justice, geographic information science, computer engineering technology, computer science, communication, and business administration. Students also may choose to obtain a double major. As the unmanned aircraft systems, more commonly known as drones, industry continues to break new ground, Kansas State Polytechnic is at the forefront of this revolution. They understand the importance of providing students with research opportunities, cutting edge technology and equipment, and an exclusive education. That’s why they built one of the largest enclosed UAS flight facilities in the nation and were awarded the country’s first approval to provide commercial flight training. In their UAS program, students log flight hours by piloting a diverse fleet of unmanned aircraft through our structured multirotor and fixed-wing training courses. After completion, students act as instructors in entry-level flight classes. With 50 years of experience in Aviation education, training, and research, UND was the first to offer a UAS degree in 2009, and their program has led the way ever since. You'll gain expertise to work in a crew environment as a Pilot operator, sensor operator, or other key team member of unmanned aircraft systems. You'll also gain a clear understanding of National Airspace System safety and operations procedures. UND offers a comprehensive UAS Aviation degree including relative topics such as: human factors, crew resource management, autonomous systems, counter UAS applications, experience in small, medium and large UAS, safety management, and aircraft systems. Their Grand Forks campus has been called "the Silicon Valley of unmanned aircraft systems" by the New York Times. UND students are given the opportunity to interact with small and large UAS companies such as Northrop Grumman, General Atomics, and Customs Border Protection. Flights are conducted regularly where UND flight students are jointly flying next to Unmanned Aircraft in the National Airspace System. Through the Bachelor of Science in Aeronautics: Unmanned Aerial Systems at Liberty University, you’ll become a professional unmanned aerial system operator by earning a Private Pilot certificate and an Instrument Flight rating. Learn to operate small unmanned aerial vehicles safely and ethically. With this degree program, you may also have the opportunity to earn a full industry certification on the medium-sized Aerosonde vehicle (U.S. citizens only). You may also have the opportunity to become a UAS instructor. This exciting opportunity to fly and become fully certified on the Aerosonde is available to you through a partnership with a UAS industry leader. With a sixty year legacy of providing exceptional flight and maintenance training, LeTourneau University is well-equipped to train aviation professionals to meet the needs of this high-growth industry. At LETU, their goal is for their Unmanned Aircraft Systems graduates to become effective and exemplary aviation professionals who will become leaders in this new and rapidly expanding industry. Classes include: Introduction to Remotely Piloted Aircraft Systems, Remotely Piloted Aircraft Operations, Remotely Piloted Aircraft Flight Control Systems, Aviation Safety Factors. Troy University became the first university in Alabama to offer a program in unmanned aerial systems when the new minor launched in the fall of 2014. The minor is part of the Bachelor of Applied Science in Resource Management and Technology and falls under the auspices of the College of Arts and Sciences' Department of Chemistry and Physics. 1. Soil and field analysis: Drone’s can play a vital role in the daily life of the farm right from the onset of the crop cycle. When equipped with high-quality onboard sensors, they can produce precise 3-D maps of the farm. These maps can then be used to conduct early soil analysis as well as aid in the planning of seed planting patterns. Once crops are planted the data derived from drone imagery can be used for irrigation and nitrogen-level management. 2. Crop Monitoring: One of the biggest challenges that farms face is the sheer size of their vast properties. The challenges posed by this footprint is amplified by the increase in unpredictable weather conditions that can subsequently drive up maintenance costs and stall productivity. Drones allow for real-time monitoring that is far more accurate and cost-effective than previously used methods like satellite imagery. Platforms like the Albatross UAV, offer users custom tailored drone packages designed to monitor nutrients, moisture levels, and overall crop health. 3. 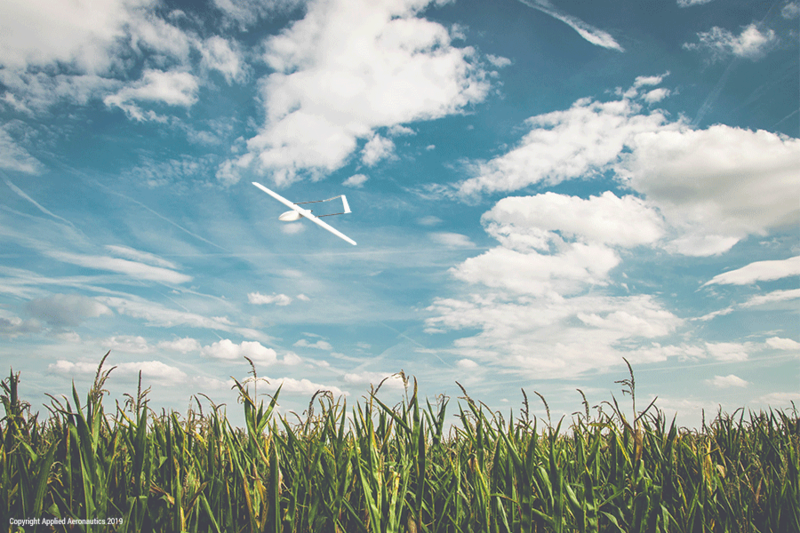 Crop spraying: Distance measuring equipment allows a drone to adjust it’s altitude as topography and geography change, thus avoiding collisions. This same onboard technology can be used to assist with the task of spraying crops. Drones can scan the ground and in real time modulate distance from the field to spray the correct amount of liquid. The result is increased efficiency as well as a reduction in the number of chemicals penetrating the groundwater. Experts believe that aerial spraying will allow this task to be completed five times faster than if done with traditional machinery. 4. Irrigation: Drones equipped with hyperspectral, multispectral, or thermal sensors can identify areas that require changes in irrigation. Once crops have started growing, these sensors can calculate their vegetation index, an indicator of health, by measuring the crop’s heat signature. 5. Health assessment: By scanning crops with visible and Infrared (IR) light, drones can identify which plants may be infected by bacteria or fungus, helping to prevent disease from spreading to other crops. With Multispectral images, you can detect diseases and/or sickness before its even possible to identify it with a human eye, potentially amounting to substantial savings. For more information on commercial drones, please visit www.appliedaeronautics.com. UAV aircraft can be distilled into two categories, fixed wing and, rotary wing. Today we’ll be addressing fixed-wing platforms, which we believe offer significant advantages in most commercial applications. Increased Operational Efficiency: Fixed-wing platforms are more operationally efficient than quadcopters. This translates into longer flight times, extended range and consequently more ground covered per mission. Where the average quadcopter can get around 15-25 minutes of flight time, fixed wing systems gets anywhere from 1-5 hrs, making them better suited to missions with extensive data collection needs as well as long-range ISR, search and rescue support and emergency management. Better Aerodynamic Performance: Fixed wing systems also offer better aerodynamic performance and are only marginally influenced by environmental conditions so they can accomplish missions in high winds making them well suited for use in a range of environments. Greater Payload Versatility: Fixed-wing platforms are capable of carrying far greater payloads for longer distances than quadcopters. This allows the end user to carry more and bigger sensors as well as twin sensor configurations and vital supplies for things like search and rescue missions, humanitarian projects. etc. The incentives to hone in on UAS consulting for agriculture are obvious: even part-time drone consultants can make $20,000 to $30,000 per year serving an industry that is always plagued by weather-related variables. Some of the most successful drone consultants make six figures or more. “Drones are increasingly used by emergency organizations to quickly collect reliable data from impacted areas that are unsafe or impossible for humans and other human-crewed vehicles to reach. This data allows response crews to identify which areas require immediate assistance, facilitate search and rescue efforts for survivors and survey damage for future rebuilding and insurance purposes. The flooding and other damage caused when Florence barreled ashore along the southeastern U.S. last week has become the latest proving ground for drones. Scores of them have been used by utilities, state and local emergency agencies, and others. They provide a bird’s eye view of damage or victims, and cameras and sensors can aid in mapping. A better understanding of the data and images gathered by the drone-borne instruments could lead to new ways for cranberry growers to detect insects and disease weeks sooner than traditional scouting forays on the ground. Such foreknowledge would allow them to treat threatened plants earlier and avert more widespread damage and crop loss, according to Luck. And because farmers would know more precisely where to spray, they could reduce pesticide use, which would be a major cost saver and a boon to ecosystems already overburdened by chemicals. When it comes to search and rescue missions, time is of the essence, with seconds being the difference between life and death. Unlike traditional manned aircraft, drones can be deployed quickly and easily, and cover huge swaths of land in mere minutes. Equipped with onboard sensors, they can easily spot missing persons, leading to speedy and successful recoveries. UAVs provide a new and critical point of view for inspecting areas that may have otherwise been too risky or conspicuous to assess. In these cases, flying a drone overhead provides the opportunity to get a detailed picture of the scene below without compromising operator safety. For instance, they can provide high-level feedback on illegal border crossing, the smuggling of assets, and theft in industrial environments. They can also provide a live stream of detailed data back to the operator to provide personnel with real-time, actionable intel that they can then use to assess potential threats and strategize a response. UAVs play an integral role in combating crime on our oceans. They can be used to monitor and analyze, nefarious vessel movements as well as track illegal fishing activity. The data provided by drone technology allows law enforcement to identify hazardous areas, determine potential assault locations and execute a more effective, targeted response to threats. The scope, scale and remote location of many oil and gas facilities create a uniquely challenging set or security concerns. For instance, the prevention of pipeline sabotage, theft, and illegal trafficking. Long-range drones allow for efficient real-time surveillance of large areas from a secure base station, thereby mitigating risk and reducing profit loss. UAVs play an important role in security and safety at major events. This includes everything from crowd control and infrastructure security, to completing an initial security risk assessment and subsequently developing a unique security plan. In addition to providing a real-time aerial perspective, UAVs allow for rapid reaction and the visual documentation of sites leading to more effective future risk management and security planning. Monitoring traffic patterns is necessary for providing a detailed blueprint of the use and performance of our road networks. The data collected from UAVs can be used to support safety, performance and maintenance efforts on our roads and bridges. At present, many state and local authorities utilize helicopters to achieve an aerial perspective, however, UAVs can provide a much more efficient and reliable alternative. Today’s long-range drones use waypoint navigation, which allows them to be programmed to fly along predetermined routes repetitively for up to the minute data collection. Unmanned aircraft are also significantly cheaper than helicopters, meaning they can be deployed more often, thus increasing the overall performance of the traffic monitoring operations. Because poaching typically occurs in large parks and habitats, close, regular surveillance of these areas is quite difficult. Aerial surveillance via manned aircraft can be helpful in the fight against poaching, but with this comes high operating costs. A long-range surveillance drone is the perfect solution in these cases. Drones can be equipped with standard RGB cameras as well as thermal cameras and sniffers that allow them to detect poachers in even the most remote environments. Unmanned aircraft like the Albatross UAV from Applied Aeronautics can cover large areas at a fraction of the cost of a helicopter and can be kept on site for rapid deployment. Perhaps most importantly, drones like the Albatross, have a very low noise footprint, so they won’t disturb the animals or alert poachers to the presence of the drone. Sign up to get updates from Applied Aeronautics! Thanks for signing up! We're so excited to have you on the Applied Aero Team.